Rob Cesternino and Akiva Wienerkur continue their journey to watch every Seinfeld episode as they discuss Season 3, Episode 2 “The Truth”. 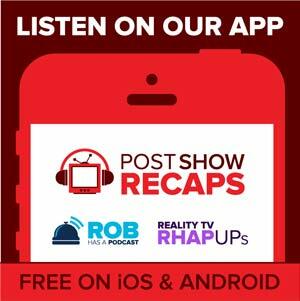 It was all honesty in tonight’s recap, the 19th installment of the Seinfeld: Post Show Recap for Rob and Akiva. 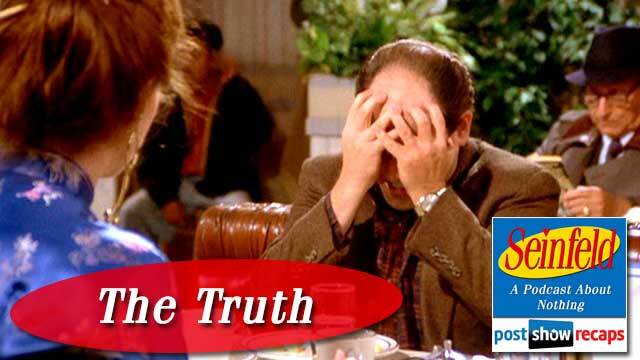 “The Truth” was the second episode of the third season, and first aired on September 25, 1991. Rob started right off by describing “The Truth” as an underrated, journeyman episode. Akiva agreed, calling it not great, but not bad. Rob did think that the name of the episode was a bit odd, offering that perhaps they could have named it “The Audit” instead, since “The Truth” doesn’t help to remember what it was about. Akiva noted that this episode was a bit mysterious, in that there was no DVD commentary, production notes or behind the scenes footage. They jump right into recapping with Jerry’s stand up, which he talks about the extra buttons that are provided when you buy a jacket. Rob found it strange that Jerry actually had the pouch with the buttons in it, when Jerry is anything but a prop comic. The opening scene of the show has George sitting at Monk’s Diner with a woman he’s dating. She had chop sticks in her hair, and spoke in a very pretentious manner, which George clearly wasn’t a fan of. The scene cuts to Jerry and Kramer at the apartment, who are going through Jerry’s receipts. He is being audited because Kramer convinced him to donate to a cause to help the Krakatoa’s with a pending volcano eruption, a charity that ended up being fraudulent. Jerry only gave him the donation because he was on a date with Elaine and was trying to be a big shot. When Elaine comes in, she’s not happy because Kramer is dating her roommate, and has been wreaking havoc on her apartment, particularly her pasta strainer. Rob, as the resident Italian, agreed with Elaine that there is no reason that the sauce would go on the pasta before it goes through the strainer. Akiva had never cooked pasta, so he didn’t know. Elaine starts making fun of Jerry when she finds out about the fraudulent charity causing him to be audited. Jerry explains that everything will be fine because George is dating an accountant, and she’s going to help him out. The scene cuts back to George now breaking up with Patrice the accountant. He delivers the famous line “it’s not you, it’s me”, amongst other excuses for why he wants out of the relationship. She pressures him that there must be some other reason, which causes George to spout off how he thinks she’s pretentious, and can’t stand how she says everyone’s full name. Rob wondered if they were playing off the famous scene, “you can’t handle the truth” from A Few Good Men, but Akiva pointed out that it came out after this episode premiered. As Patrice get’s up to leave after being broken up with, she asks George how much she owes for the lunch, and he tells her four dollars. Akiva noted that this is at least the third reference so far to George’s cheapness. Back at Jerry’s apartment, he is talking about how lucky he is to have this accountant take care of his audit. He describes how violently he’d kill Kramer if this wasn’t so. When George comes in, he’s so happy that he is free from Patrice. He forgets that he had her take Jerry’s receipts. When Kramer hears this, he sneaks out of the apartment without a word. Rob said it reminded him of how a dog will silently slip out of a room when they are caught doing something wrong. George is thinking that he can fix things with Patrice, but when he tells them all how he broke up with her, Elaine explains how bad it was to tell the truth. He thinks that telling the truth was no big deal, but when Elaine reveals the truth that he is cheap, he takes it terribly, proving her point. When George tries to call Patrice to make amends, she hangs up on him. In the next scene at Jerry’s apartment, Kramer comes in with a windshield he found on the street. He’s going to make it into a coffee table for Elaine and her roommate’s apartment. Elaine comes in acting very awkward, and it turns out that Kramer accidentally walked in on her naked. Rob and Akiva discussed who they would rather have date their female roommate, and both decided George rather than Kramer, since you could make fun of George all the time. Kramer tries to make it right with Elaine by offering to get naked for her, which Jerry shuts down right away by saying he’s always welcome, but not “Mr. Johnson”. Rob thought this might have been a bit of a risqué statement for television in 1991. Next, George walks in saying he couldn’t get the papers back, since Patrice had checked herself into a mental institution. There is a mid episode standup piece with Jerry talking about how he would like to wear a belt when he’s naked so he’d have something he could adjust. Akiva shared that he doesn’t like the mid episode standup break, thinking that there is so little time for the actual show, why would they cut more time out. He adds that this is their favorite show of all time, and the extra critiques he has are merely just observations. Kramer tells a story about his friend Bob Sacamano was in a mental institution. Jerry and George decide to go out to the mental institution so they can get Jerry’s receipts back. Rob mentioned how he always enjoyed when the two go somewhere together, and how they play off each other in those scenes. Akiva likened it’s style to Curb Your Enthusiasm. When at the institution, George talks about how he would love it there, since everyone would pity him, and he could wear slippers all day. Elaine walks into her apartment to a big mess in the sink, crazy music playing, and Kramer and Tina dancing in towels. Tina asks Elaine what is wrong, but she ultimately doesn’t share the truth with her. Back at the mental institution, Jerry and George sit down with Patrice, and she asks them why they are there. Jerry said he heard she is a nice person and wanted to meet her, while George denies that he’s there because he feels guilty. George tells her he made a mistake, and she is too good of a person for him. Jerry tries to steer the conversation toward where his receipts are. Akiva thought this was a great example of the writers reminding us that Jerry and the gang are horrible, selfish people. Patrice tells Jerry she threw out the receipts since she was so upset, but could help him if he gives her the copies. They cut back to Elaine’s apartment, where Kramer and Tina start dancing around after Elaine leaves, only to crash into the windshield coffee table after turning out the lights. Akiva said that this “B” plot was a dud, and didn’t really tie into the episode. Rob thought they could have shot this scene better, but Akiva stayed true to his thought that it didn’t belong at all. Back at Jerry’s apartment, he is on the phone trying to track down receipts for the audit. As he gets ready to leave to get a receipt, Kramer comes in covered in bandages from crashing into the invisible coffee table. He asks to go with Elaine to visit Tina in the hospital, and the three all decide to split a cab. George, who is on his way to a poetry reading with Patrice, says he’ll jump in as well, but Elaine tells him he has to chip in, giving one more reference to his frugalness. Rob and Akiva discussed the etiquette for splitting cab fare, and decided it’s not worth the argument, so splitting it evenly is the best option. Jerry’s final standup is about how the IRS should be fun, since it sounds like Toys R Us. Rob and Akiva go over a few emails. Emailer Mike asked if they were offended as Mets fans that the hat on Jerry’s Nerf hoop in his apartment now is a Yankees hat as opposed to the Mets hat. Akiva wondered when it is they switch back, and will be keeping an eye out for it. Emailer Johnny asks if either had been audited, which they had not. Matthew pointed out that cilantro is the new pesto, but Akiva does not agree. He thinks that sriracha and kale are more suitable. Ian asks if Rob and Akiva have seen Mulaney yet, referring to it as a not very good Seinfeld rip off. Akiva has seen it, but found it bad so far. He really enjoyed John Mulaney’s standup, so he’ll give it more chances, since the first Seinfeld episodes weren’t very good either. Ian also shared a story how he and his wife went to a massage establishment (not a parlor), and he ended up with a male masseuse. Join the guys next week when they head down to Del Boca Vista and recap “The Pen”. Don’t forget to send your emails in to[email protected]. You can subscribe to the Seinfeldpodcast by going to postshowrecaps.com/ITunes, and while there rate the show and leave comments on the page. You can follow them on twitter @robcesternino and @keev26.